Our precipitating chromogen substrate is designed for use in membrane based enzyme linked assays with an insoluble product of horseradish peroxide (HRP). Typically, a permanent dark blue spot or band is deposited at the HRP binding site on the membrane or solid support, usually on dot blots or western blots. The substrate itself contains both hydrogen peroxide and tetramethylbenzidine (TMB) in a totally aqueous buffer system which stabilizes our unique formulation. The product which we call, NeA-Blue Precip is conveniently provided in a single bottle and is used directly as is. Safety - Our TMB formulation is 100 percent aqueous and contains no organics which can be found in other substrates on the market. Stability and Sensitivity - Our TMB substrate is as stable and sensitivity as those currently offered on the market today. Lot-to-Lot Consistency - This is critical for your reproducible results and why our TMB product is monitored and tested regularly in order to maintain a consistent lot-to-lot production. User-friendly - Our TMB product is 100 percent water based containing no solvents or organics such as DMF, DMSO, methanol or acetone so there is no issue of safety with the substrate user. This product being non-restricted will not disrupt the process of shipping in regards to special compliance issues. Convenient - A ready to use single bottle our NeA-Blue TMB substrate comes in several standard formats such as 100 mL, 200 mL, 500 mL, and 1000 mL. We are also able to supply the substrate in custom sizes upon request to meet your specific requirements. Shelf Life - When released and available for purchase, NeA-Blue Precip TMB substrate is stable for 1 year when stored at 2C to 8C. 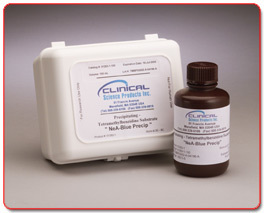 Reserve Lots - Clinical Science Products, Inc. offers the opportunity to reserve quantities of our TMB product. This way buyers can request full or partial shipment of reserves as needed while taking advantage of price savings with a bulk purchase yet not making demands of storage at the buyers facility until needed. Pricing - Available upon request. Price quotations can be provided according to buyers requirements via fax or email request. We are here ready to assist in your needs and offer a free evaluation sample upon request.